Mount Wellington is an imposing feature of Hobart’s landscape and it was a given that we would ride up on the Bromptons. In true Mount Wellington form, the weather was pleasant at the bottom, and cloudy and freezing at the top! We had carried all our winter clothing up the mountain in the T-bag for this very reason! 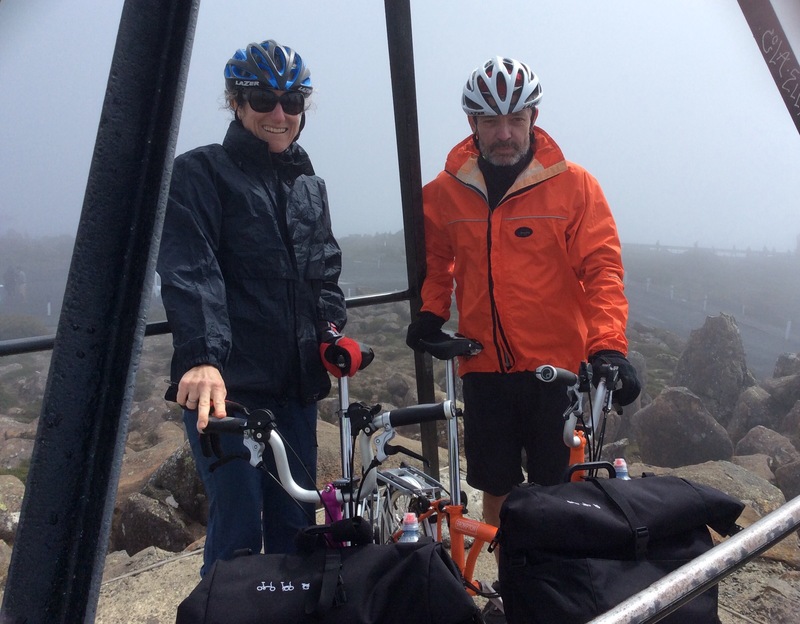 Our friend, Ron, insisted we get photo at the absolute summit of Mount Wellington so the Bromptons were lugged up over the rocks so we could pose in our full winter gear! 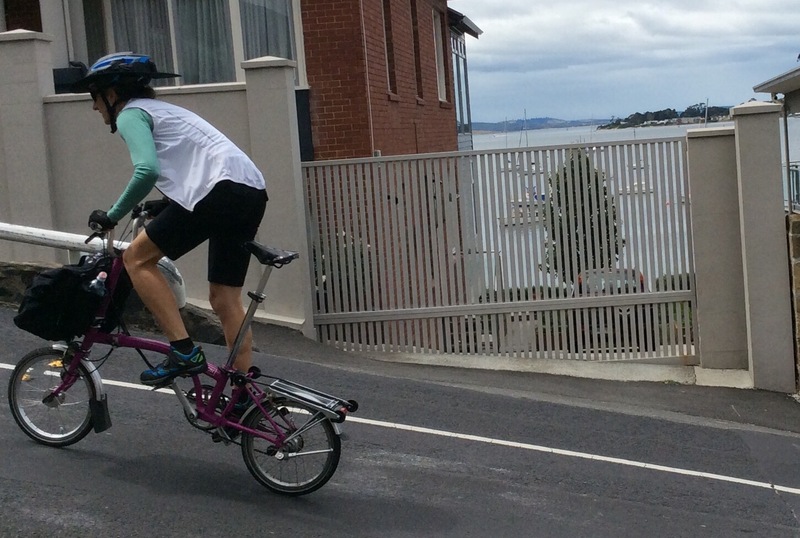 Our Bromptons both have 6 gears and we both spent pretty much the whole way in the lowest gear steadily churning away. There were no far-reaching views from the mountain today. The descent was not the most pleasant one, with a bumpy, pot-holed road, billions of tourists and camper vans and people standing on the road taking photos. The Bromptons handled it well though, with good braking capacity (something Jen was worried about), and a nice stable ride. 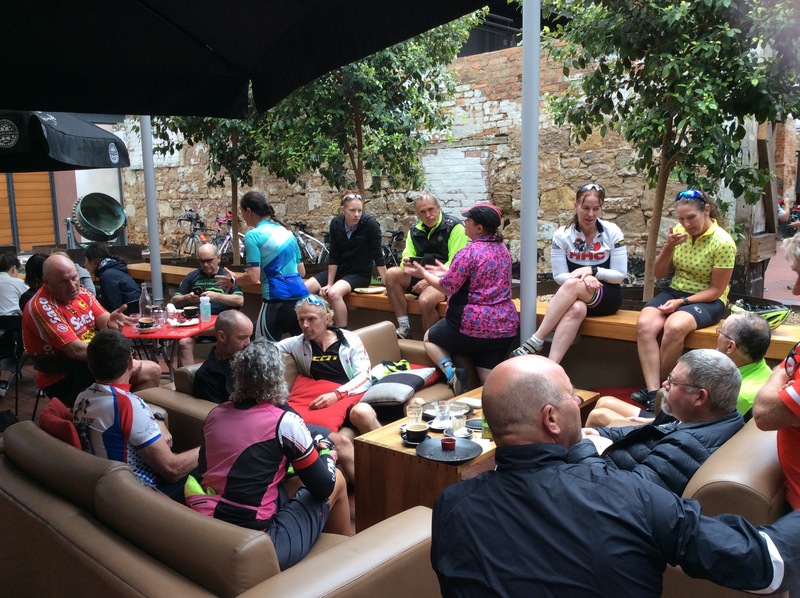 We had more coffee with the cycling group at Henry Jones (the cafe is called ‘Jam Packed’), and rode home along the bike path for a quiet afternoon. The last couple of days have involved lots of riding around visiting people and generally having fun on our bicycle holiday! 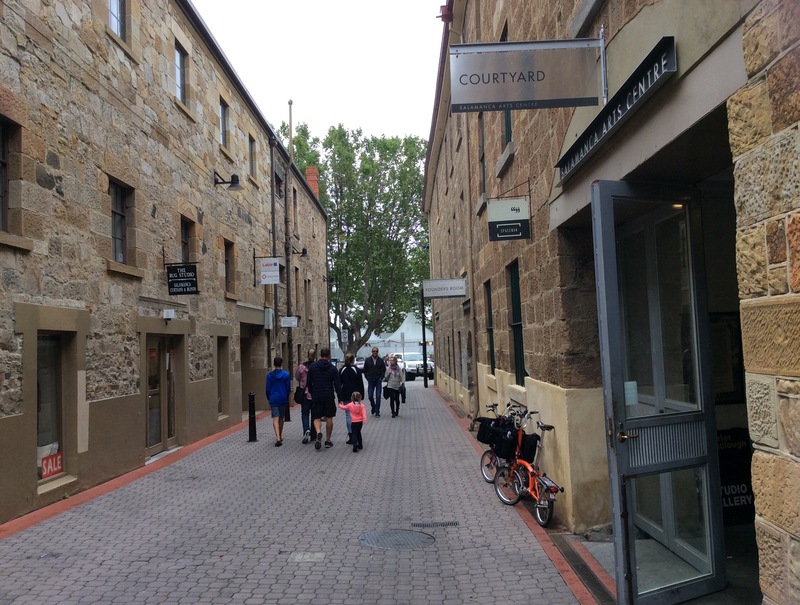 We have ridden to Kingston over ‘the Bonnet’ (Bonnet Hill) to visit a friend for breakfast, into Salamanca Place for coffee…. 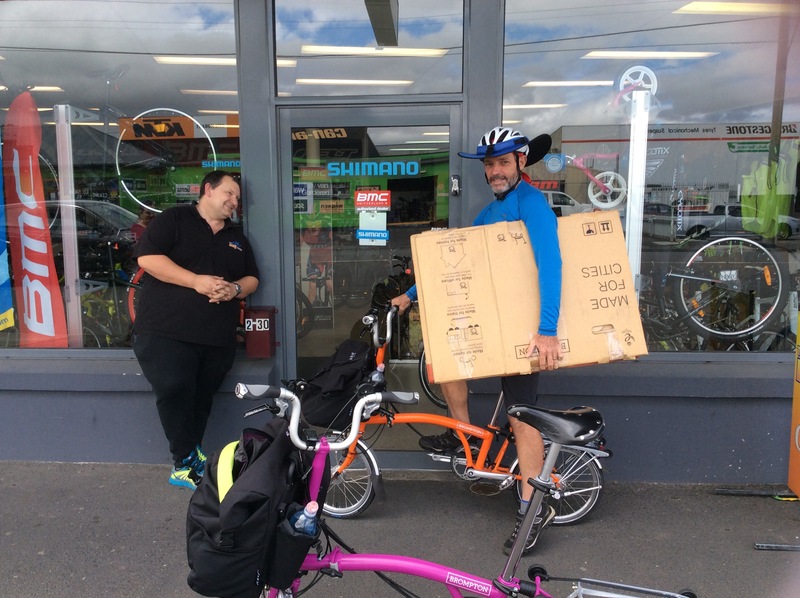 …and visited Marty and Juliette, who bought our old bike shop from us, ‘The Bike Shop’ in Moonah… We enjoyed the friendliness of cyclists of all persuasions who acknowledged us with a friendly wave whether they were in Lycra or wearing stubbies and appreciated the courteousness of the Tasmania traffic. The weather was perfect for cycling all day, unlike the tropics where it gets too hot. Tomorrow we will get a lift to the airport (thank you Liza!) and head home feeling exhausted but happy after some wonderful days of cycling, eating, hanging out with friends and good Tassie fun! 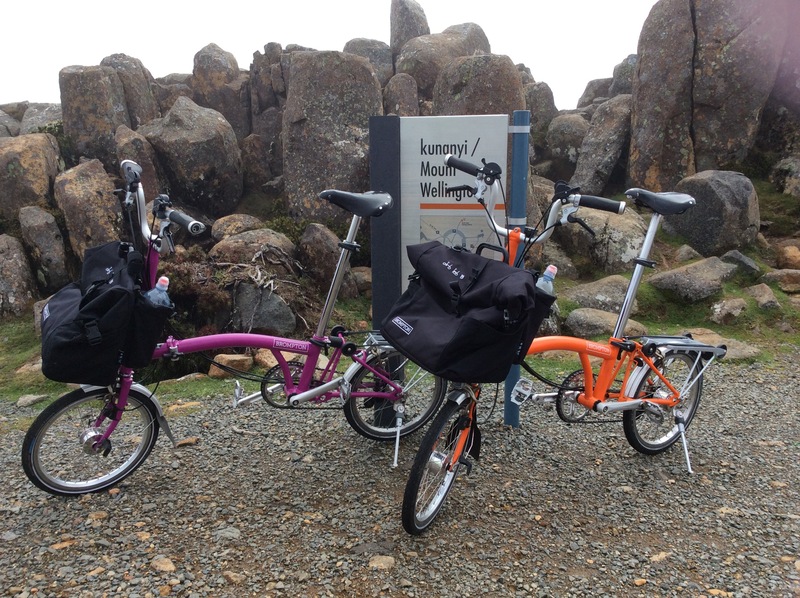 Glad you had a great time here in Tassie on your Bromptons. Thanks for sharing your story! What a great end to your holiday! I do have one question though; how did you get the Brompton box at the end? I thought you disposed of the ones you flew into Melbourne with. Did you send your friends a couple of empty boxes? Or are they dealers now, too? We had some Brompton boxes sent to our friends. The dealer here in Hobart didn’t have any boxes available before Christmas so we organised for them to be sent down. If we couldn’t get the boxes we probably would have just used a regular bike box and cut it up and taped it instead. Great to see you’ve had a good ride and the bromptons did the job. I don’t miss riding on oz highways at all.